A common question we get in the reception is which objects you absolutely cannot miss on a visit here. There are over 220,000 objects in the collections of which 8,000 are on display. It’s a jungle out there and the answer to the question is different depending on who you ask. If you ask me, it’s these. Together, they show glimpses of the museum’s history and show the range of objects we have here at the museum. Dried hippopatamus skin. Image: The National Museums of World Culture, Sweden, CC-BY. Carl von Linné scholar Adam Afzelius traveled to Sierra Leone on Africa’s west coast during the 1790s. He lacked the drawing skills necessary to document what he encountered, so instead he decided to simply send this hippo. But to save on shipping he only sent its skin. 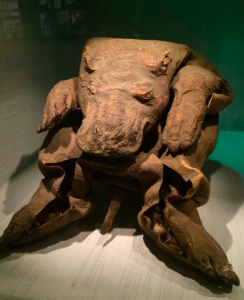 Some say that for a long time, many Swedes believed that this was what a hippo looked like—all shrunken and weird. Common belief at the time was that everything was created by God; the Linné scholars collected everything, including animals, as they believed it was all a part of the mapping of the world. In the exhibition where the hippo is on display, there are stars in the ceiling. They symbolise the fact that the great explorers during this time were seen the way astronauts are seen today—they went to worlds that you couldn’t even dream of visiting. The objects they brought back had never been seen before; this was how the world started to come to Sweden. From this time to the beginning of the 1900s, the collection was part of the Swedish Museum of Natural History. The original totem pole at a burial site in Kimano, Kitlope in 2014. Image: The National Museums of World Culture, Sweden, CC-BY. 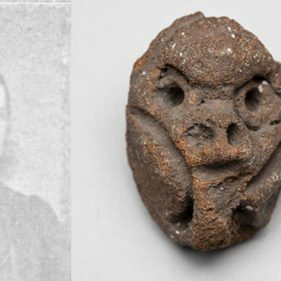 This is the object we first encounter at the museum and it is perhaps our most famous one. What we see here today, however, is a replica of the original that was once housed at the museum. 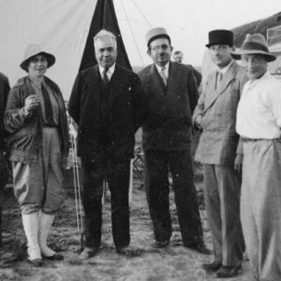 In 1927 the original pole was chopped down and donated to Swedish Consul Olof Hanson. But during the years that followed, questions started to arise regarding how the pole had actually come to Sweden. Was it bought or stolen? 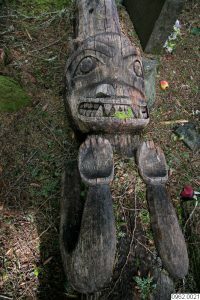 The Haisla people of the Northwest Coast of Canada requested that the pole return to them and in the 1990s the Swedish government decided that it would. In 2006, it was. When the original pole reached Canada it was celebrated with song, dance and festivities during two days of celebration. A condition for the repatriation was that the object should be preserved for the future. A replica was made and placed outside the museum entrance in Stockholm. According to the traditions of the Haisla people, a fallen pole should stay down and decay to let nature have its course. Today the original pole is on the ground. The replica preserves this tradition for the future, to be able to tell its story. Elefant tusks, with carved mythological figures. Image: The National Museums of World Culture, Sweden, CC-BY. 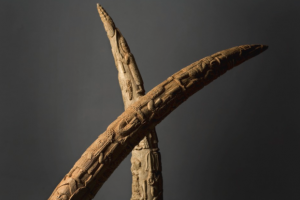 These elephant tusks are from the kingdom of Benin, today’s Nigeria, and are now considered to be one of the world’s most famous art treasures. The tusks were once placed at an altar at the king’s residency in Benin City; each tusk has carving that tells the story of the ruler’s life. In so doing, they linked the king to former rulers in a spiritual sense. In 1897, the Englishmen took the city and deposed the king, emptying the palace of its treasures. These treasures became known to the western world when they were spread to private collectors and museums all over the world. However, in the 1940s and 50s several of these objects were bought back to Nigeria through auctions. Some of the objects were successfully hidden from looters. The country now houses a representative collection, some of which can be found in the royal palace and some in the local museum. 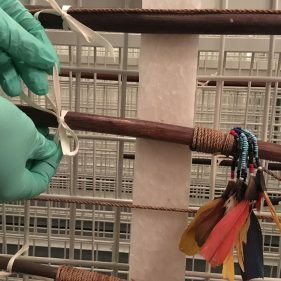 But to whom do the objects at our museum belong, and where is their future? Samurai gear från Kyoto, consisting of a helmet, face mask, chest- and back shields, protection for shoulders, arms and legs, and shoes. Image: The National Museums of World Culture, Sweden, CC-BY. Beautiful swords and outfits for big and small can be seen in our permanent collection on Japan. 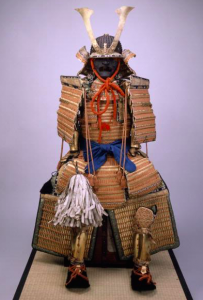 Here is an example of the samurai armours we have on display. 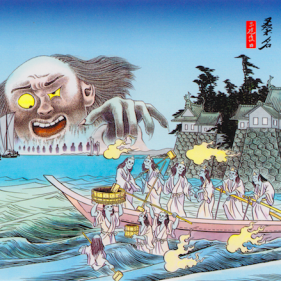 Here we are in the Edo period (around 1600-1868), a time known for its isolationism—it was hard to leave Japan and equally hard for outsiders to visit. A lot of what we today view as characteristic for Japan was shaped during this period, for example sumo wrestling, geishas and netsukes. It was a strictly divided society were everyone was born into a class (enforced by law) and related assignments. Among the highest were the noble warriors, the samurai. 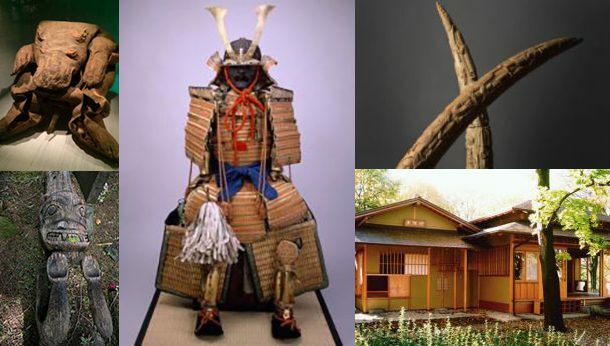 The samurai were constantly ready for war and their armour was meant to both protect and scare. They obeyed the warriors path, called bushidō; the honour code ruled their way of life and even how they should die. Dō means “way” and several of the martial arts we have today have their roots from this time (which we also can see in the name) for example judo, aikido and iaido. According to the law, the samurai must always wear two swords, the long katana and the short wakizashi. The only place the samurai couldn’t wear the swords was when they entered a tea house. The tea house Zui-Ki-Tei. Image: The National Museums of World Culture, Sweden, CC-BY. This is our biggest object, namely a whole house. During the summer season, the local Japanese tea society arranges tea ceremonies and celebrations of Japanese holidays here. This particular building was brought here in 1990 but the very first tea house was here as early as 1935, that is long before the museum even had its own building for exhibitions. Unfortunately the house burned down in 1969. 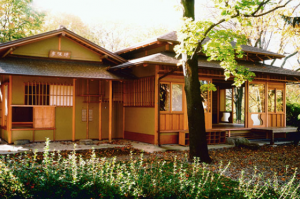 It was the pioneer Ida Trotzig that—through her passion for Japan—made sure that this building was built. The tea house consists of two houses; both were first built in Japan and where then shipped to Sweden for assembly. Still today, the tea house is treated in a Japanese matter. For the 25th anniversary of the new building, three craftsmen came from Japan to restore the house. See a video of that here. Read more about the tea house here.